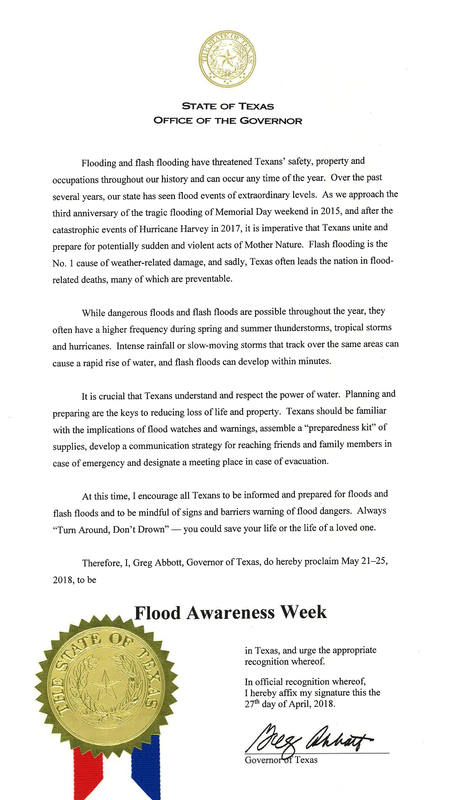 Texas Governor Greg Abbott proclaimed May 21-25, 2018 Flood Awareness Week. Most Texans have experienced flooding, often in major ways. Events like the Memorial Day and Halloween floods in 2015, Hurricanes Ike and Harvey in 2008 and 2017 respectively, and Tropical storm Allison in 2001 have made a major impact. It is vital that Texans stay informed of what to do in the event of a flood in order to ensure personal safety and the safety of loved ones. There are several common types of flooding, each with its own characteristics. Be diligent when it comes to flooding and learn how these may be relevant to you and your location. Flash Flooding – Flash floods are rapidly rising and fast moving waters. It can happen anywhere and is usually caused by intense storms that produce significant rainfall in a short amount of time. The NWS defines a flash flood as any flood that begins within six hours of a heavy rainfall. Flash flooding over roadways and at low water crossings are some of the most dangerous occurrences. Coastal Flooding – This type of flooding happens near large bodies of water. It is usually the result of critical events, like a hurricane or tropical storm that will cause storm surges that push water onto land from the adjacent body of water. This happened with Galveston Bay during Hurricane Ike and in Rockport during Harvey. Riverine Flooding – Also known as fluvial flooding, riverine flooding happens when excessive rainfall over a prolonged period causes a body of water like a stream, river, or bayou to exceed capacity and overflow. Ponding – Ponding, or pluvial flooding, is another type of flooding that can happen anywhere. It tends to occur in relatively flat areas where water collects in depressions and cannot drain out. When water ponds in wheel paths or ruts on a roadway, it can be especially dangerous as it may affect steering. Ponding can also occur in neighborhoods which may cause accessibility issues. Sheet Flow – This type of flooding happens on land that has a slope or a hill. It typically occurs after an intense rainfall that is unable to soak in the ground. The water will flow over surfaces rather than being diverted into channels, culverts, or pipes. It isn’t concentrated like a flash flood, rather it is spread across a wide area. It is important to know any flood status in your area. Be familiar with the warning signs and what they mean. Local news stations and public officials will warn you when a flood event may occur or is occurring near you. Flood watch means to be aware that conditions are right for flooding in your area. Flood warning means flooding is imminent or is already in effect. Texas often leads the number of deaths related to flash and river flooding. In 2017 there were 70 deaths in Texas as a direct result of flooding. It is important to understand and respect the power of water. It only takes 6” of rapidly moving water to knock over an adult. In that same vein, 12” can carry off a small car, and 24” can move a larger vehicle like an SUV or truck. More than 50% of flood-related deaths are caused by someone walking or driving into floodwaters, according to the NWS. Flash flooding is the number one cause of weather-related property damage. Hurricane Harvey caused upwards of $100 billion in damages. The Memorial Day flood severely damaged or destroyed nearly 2,100 homes. Check FEMA’s floodplain maps to know if you are in a flood zone. Consult an expert to determine if you may need flood insurance. Know your watershed and areas with known flood hazards. Identify possible routes that avoid those areas. Stay Informed by turning on emergency alerts for your cell phone or listening to the National Weather Service Radio. Have emergency supplies on hand, including water and food. Pay attention to warning signs; never drive around barriers blocking a flooded road. Photograph your property in case of damages for insurance purposes. For updates on what is happing around Texas regarding local flood regulations and other related information, please check out our current posts or subscribe to our monthly post summary. For other useful flood-related information check out the links below.